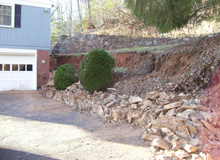 Goals: During a heavy winter rain, an old eight foot tall retaining wall collapsed into the Bridges’ driveway, leaving them with a massive pile of debris, which blocked the entrance to their garage and access to a set of concrete stairs, which were used to access the back yard. 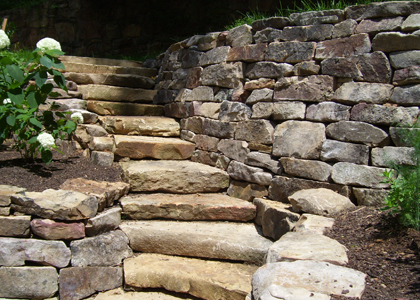 The Bridges asked us to rebuild the wall and new set of stairs. 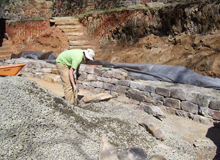 Challenges: Removing all the debris of the collapsed wall before our work could begin and creating a new hardscape design that was more interesting than one single faced eight foot wall. 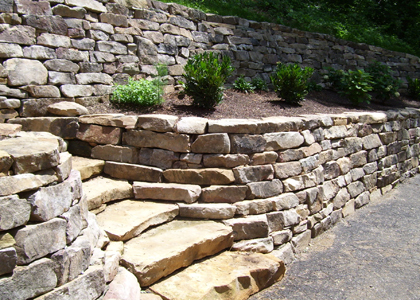 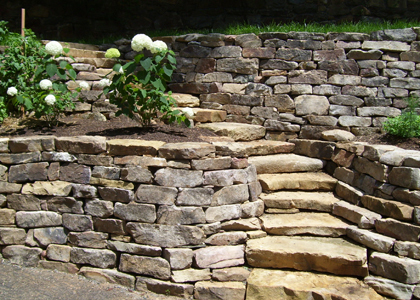 Results: We designed a two-tiered system of retaining walls which allowed for a planting area in between the hardscape and the ability to incorporate a beautiful set of curving boulder steps which gracefully rise up through the walls.